Chives (Allium schoenoprasum) are an edible member of the Allium genus—a flowering family of plants that include garlic shallots, leeks, and scallion. The lower stalks and bulbs of this herb have a mild, clean, oniony flavor that is often used to garnish on foods such as baked potatoes or deviled eggs. Chives are most often used to flavor food. But some people also hope to gain chive health benefits when they use the grassy plant medicinally. The most common way that people use chives in natural medicine is to treat parasitic worms. These are disease-causing worms that live and feed in or on a human. Researchers have investigated the role of many different natural products to treat neglected parasites, including lemongrass and garlic. But there is not enough evidence to support the use of chives to manage parasites. Some people also use chives to reduce the risk of infection, reduce water weight, or as a stimulant. Currently, there is not enough evidence to support these health benefits. One tablespoon of fresh, raw chive provides less than 3 calories, most of which come from carbohydrate (fiber) and protein, according to USDA data. Minerals in chives include calcium (3 mg), phosphorus (1.7 mg), and potassium (8.9 mg). But eating a serving of chives will not significantly contribute to your vitamins for the day. Vitamins in chives include vitamin A (3 percent of your recommended daily intake), vitamin C (3 percent), vitamin K (8 percent), and folate (1 percent). You may see chive oil in some supermarkets. Some cooks even make chive oil at home. Keep in mind that chive flavored oil provides significantly more calories because it is usually a combination of a cooking oil (like canola oil) and fresh chive extract. You'll find fresh, raw chives in the produce section of almost any grocery store. Usually, they are packed in bunches. Chives are available year round. 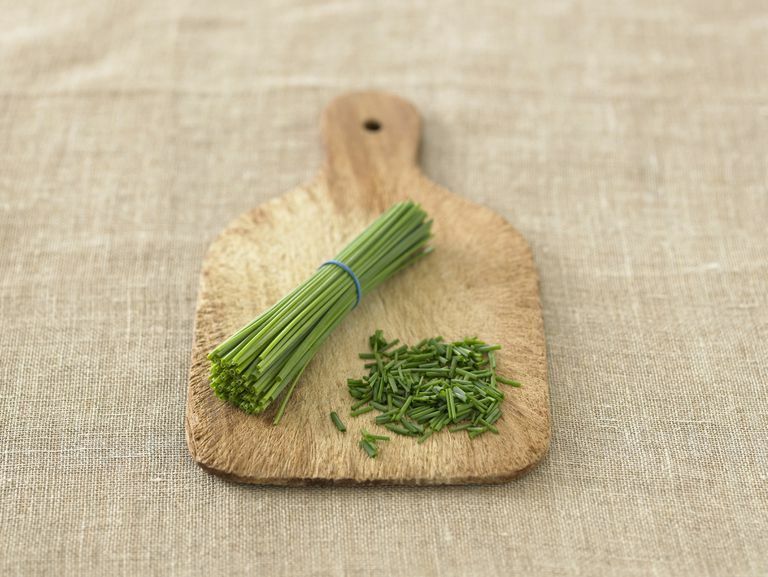 When choosing the best chives, look for full stalks that are bright green and evenly colored. Avoid chives that are wilting or starting to yellow as these are older and won't last as long. When you bring chives home, don't cut them until you are ready to use them. Wrap them in a paper towel and refrigerate until you need them in a recipe. They should last about a week. To use chives in or on a dish, chop them with a sharp knife or use a pair of kitchen scissors to cut them into quarter-inch sections. Some people also buy and use freeze dried chives because they last longer. However, since fresh chives are readily available and generally inexpensive, most cooks prefer the fresh variety. One of the most popular ways to enjoy chives is on top of a baked potato with other toppings such as butter or sour cream. If you are watching your weight, chives alone are a great way to add flavor without adding calories to the potato. Chives also complement cream cheese, eggs, green salads, mayonnaise salads, and as a garnish. Snip chives immediately before use as their delicate flavor fades fast. There are few known side effects to eating chives, although some sources report that you may experience indigestion if you eat too much of them. If you have an allergy to onions or garlic, you may experience a reaction when consuming chives. According to one source, chives contain diallyl disulphide and possibly allicin, which may produce a reaction in some people. Yes, although the texture of chives may change when you freeze them. There are different methods that cooks use to freeze this herb. You can chop chives and place them into the sections of an ice cube tray, then fill with water to freeze. Or you can place the chives in a baggie and remove extra air so that it is vacuum sealed. ﻿What is a suitable chive substitute in recipes? You can use garlic, shallots, leeks, or scallion instead of chives in a recipe. But you may need to adjust the amount as chives have a lighter flavor. If you are using chives as a garnish, you can substitute parsley or cilantro. Ndjonka, D., Rapado, L. N., Silber, A. M., Liebau, E., & Wrenger, C. (2013). Natural products as a source for treating neglected parasitic diseases. International journal of molecular sciences, 14(2), 3395-439. DOI: 10.3390/ijms14023395.